Finishing up her final season on the Pitt diving team, senior diver Meme Sharp will leave a legacy as one the greatest divers in the program’s history. Sharp has acquired a number of accolades and set several records during her diving career at Pitt. She currently holds the record in the 3- and 1-meter dives and set the record in the platform dive as a first year. Sharp also finished as a finalist in the 1-meter dive at the ACC Championships in 2015 and 2016 and was an ACC Champion and NCAA All-American in the 3-meter dive in 2016. Outside of Pitt, Sharp recently competed in the 2017 USA Diving Winter National Championships and won the 1-meter National Title. She also qualified for the 2016 Olympic trials to make the USA diving team, competing against the country’s best, but not making the final cut to the official Olympic team. 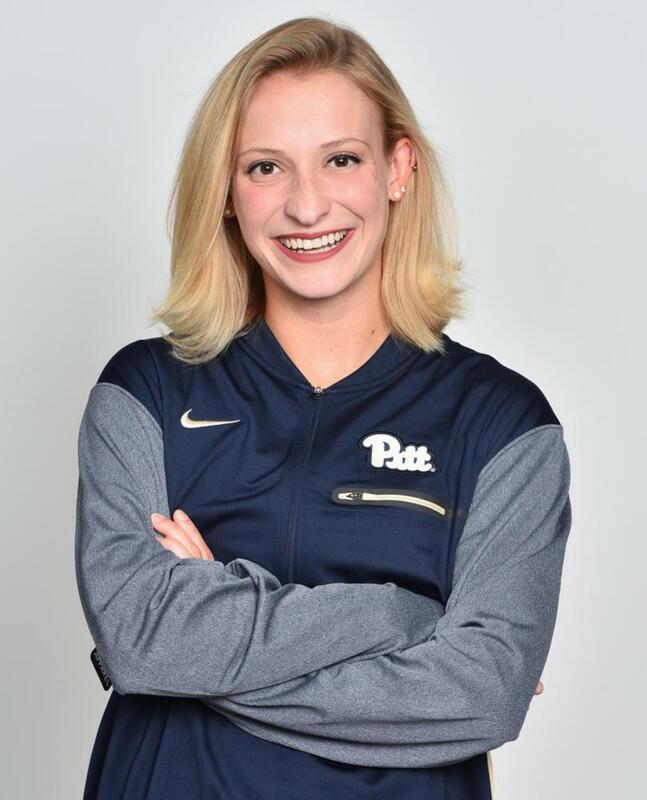 The Pitt News caught up with Sharp to about her recent successes, how she became a diver and her plans beyond the Trees Hall pool and Pitt. The Pitt News: How did you get into diving? Meme Sharp: Well, I started off in swimming, actually, and I was a cheerleader. My middle school team hired a diving coach, but they didn’t have any divers. So the swim coach approached me and asked, “Hey! I know you’ve got a cheerleading background. Do you want to try out diving?” I ended up liking diving better than swimming, so I stuck with it and started focusing more on it throughout high school. TPN: When did you start to realize that diving was going to be something you committed a lot of time to? Sharp: Well, I actually joined my club team, and through club diving you travel all over the country for USA diving meets. It was just something I really enjoyed. I really liked meeting other divers, and I liked the competition aspect of it. I think when I started with my club team back at home is when I decided it would be something I’d like to pursue past high school. TPN: What was the recruiting process like? How did Pitt recruit you, and did any other schools show interest? Sharp: Other schools recruited me besides Pitt — LSU, Notre Dame, Wisconsin, Harvard and Miami University in Ohio. Those were the main schools I had visits to, but Pitt was my first visit, and I kind of knew that I wanted to go to Pitt, so I just cancelled my other visits and verbally committed in my senior year of high school. TPN: What are some of the things that you like about the University of Pittsburgh? Why did you choose to come here? Sharp: Well, I’m from a really small town in Indiana. It’s kind of like a farming town, and the only thing to do on the weekends is go to the movies. So I think that’s the most appealing part about Pitt because there’s always something to do. If I’m bored I can usually find something to do in the different areas like Shadyside, South Side and Downtown. I also really like the campus. I like the way that it’s structured compared to the normal college setting because it feels more like a city to me. The academics are also great here so it was a perfect fit. TPN: What was it like competing at the USA Diving Winter Nationals? How were you able to perform on such a high stage and ultimately win the 1-meter springboard title? Sharp: It was my last USA diving meet. I didn’t have any high expectations, I just wanted to have fun and dive well enough that I wouldn’t have any regrets at my last USA diving meet. I had a lot of fun. I was cheering on everybody else, and I was cheering on my teammate, and I was able to relax and just take it dive by dive, and I actually performed really well. I was really happy with my outcome. TPN: How have your coaches here at Pitt, or elsewhere, helped you to perform at such a top level of diving and set? Sharp: My club coach, Sean McCarthy, really did an amazing job just kind of building a base with me, kind of breaking down my diving and perfecting my basic skills. Then, when I came to Pitt, I started off with Julian Krug. He had been the coach here for 38 years, he was one of the oldest coaches at Pitt. He was amazing. He helped me mentally become the diver I am today and approach any adversity, competition, and just mentally handle it. My new coach this year, Katie Hazelton, she is just awesome all around in everything. She’s good with the mental aspect of diving and the basics, and she just brings out the best in everyone on the team. TPN: How do you prepare for meets and do you have any special ritual or tradition that you do to get ready? Sharp: Right before the diving events, some divers seclude themselves, put headphones in and not talk to anybody. But I actually like going around talking to my teammates, talking to the other team, talking to people in the crowd. I just kind of like to keep my mind busy before I compete. I can’t sit there and focus super hard on the dive. I feel more relaxed when I’m just being myself, I guess. TPN: How was qualifying for the Olympic trials back in 2016 for the Rio De Janeiro Summer Olympics? Sharp: That was pretty crazy. It was probably the highest caliber meet that I have competed in next to NCAAs. It was just really cool to watch really good diving and be a part of it and be considered top in the country. TPN: So do you have any divers that were inspirations to you to become a better diver? Sharp: She was a senior when I was a freshman in high school. Her name is Katie Bittner and she never went on to dive in college, but she won state in Indiana. She was always really invested in me and always trying to make me feel special even though I was a freshman and always tried to include me. She was someone that I really looked up to in high school. TPN: I see that you are a communication major with a minor in creative writing. What are you looking to do as a job when you stop diving? Sharp: I’ve applied for a job through the ACC, and I am going to an interview January 30 to be, hopefully, on the event planning committee for the Orange Bowl. So I would like to do some form of event planning and event coordination. TPN: Are you going to continue to dive or start into the workforce after college? Sharp: I’m looking just to go ahead and start and hopefully to get the job I’m interviewing for. I love diving, but my dream was to just do it in college and be successful in college. I never had the dream to do anything past that so I achieved my goal. TPN: How does it feel to know that you’ll go down as the greatest women’s diver in the history of Pitt diving? Sharp: It’s an honor, really. I’m just happy I was able to do that representing Pitt. I was able to do that with an amazing group of teammates and my coach Julian, and now I’m coached by another awesome coach, Katie. It was really the help of all of them that got me to this point, and it’s just an honor to have met so many great people. TPN: What do you want to accomplish as you finish your career in diving here at Pitt? Sharp: I’m just looking to enjoy myself the last few meets. I’ve got my senior meet coming up and everybody dreams of that all throughout college, ACC’s and NCAAs. I just want to be able to know that I did the best I could and look back and have no regrets.